Many rail execs say sustainability initiatives are part and parcel of a good business strategy. In early October, the United Nations’ Intergovernmental Panel on Climate Change (IPCC) released a report painting a dire picture of the future of life on planet Earth in the not-too-distant future. Although countries around the globe had pledged to take steps to keep the global temperature rise below 2 degrees Celsius as part of the 2016 Paris Agreement, the IPCC report warned about the dangers of even a 1.5 degree increase. The report called on governments and organizations to make “rapid, far-reaching and unprecedented changes in all aspects of society” to keep the global temperature from rising to unsustainable levels. Failure to do so over the next few years could have catastrophic effects on ecosystems around the world, including the risk of more floods, droughts and destruction of wildlife, according to the report. “For example, multiple lines of evidence indicate that the majority of warmer water coral reefs that exist today will largely disappear when global warming exceeds 1.5 degrees Celsius,” IPCC officials noted in the report. The report also called on companies in several industries — including transportation — to make some quick changes to reduce carbon dioxide emissions. “Things become even more urgent when you’re talking about how to contain the 1.5 degrees,” says Werner, who also serves as vice president of corporate communications. For a while now, Class Is have been continuing efforts to boost their own environmental sustainability practices and reduce greenhouse gas emissions. Over the past several years, railroads have begun issuing annual sustainability reports to highlight ways they’re working to do just that. And while sustainability initiatives are becoming necessary to protect the environment, they’re also part and parcel of a good business strategy, rail execs say. 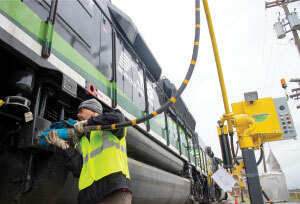 An NS employee connects a locomotive to the Sleeper plug-in heater system at the railroad’s Inman Yard in Atlanta. The system is aimed at reducing unnecessary idling, especially in freezing weather. But ultimately, the push toward sustainability is having a positive impact on business outcomes. Witness NS’ “Sleeper” system for locomotives parked in rail yards. The plug-in system charges batteries and heats engines, which enables the engineer to shut off locomotives in freezing weather. The technology enhances air quality in neighboring regions and cuts emissions linked to climate change — and reduces fuel use and costs, NS officials say. That could help meet the Class I’s goal of improving locomotive fuel-efficiency by nearly 9 percent by 2020, a goal the railroad adopted as part of its strategic plan. Projects like the Sleeper system “make good business sense and good sustainability sense,” Werner says. At BNSF Railway Co., managers are working on sustainability projects ranging from LED light retrofits in rail yards to battery electric equipment to restorative revegetation after construction projects. The railroad also explored hydrogen-powered fuel cell charging batteries for switcher locomotives, but the benefits didn’t “pencil out,” says John Lovenburg, BNSF vice president, environmental. Not that the technology couldn’t be implemented in the future, he adds. BNSF has been deploying electric wide-span cranes at intermodal facilities in Seattle; Chicago; Memphis, Tennessee; and Kansas. Since they’re electric, the cranes produce no emissions on site. There are some operational advantages, too. With conventional cranes, containers typically are stacked laterally, but the electric cranes enable stacking vertically, which means the containers and trailers are moved shorter distances. BNSF plans to roll out the cranes at other intermodal sites, Lovenburg says. But it’s often simpler to implement the technology at newer terminals. “It’s a little bit like trying to keep the restaurant open while doing remodeling of the kitchen,” Lovenburg says of efforts to install the electric cranes at existing facilities. And the sustainability push doesn’t stop with electric-powered cranes. BNSF also is exploring battery-electric yard trucks, side loaders and line haul locomotives. All that equipment can help reduce operating costs and fuel consumption, Lovenburg says. “Battery costs have been coming down, so we’re anticipating those costs will go down in the future,” he adds. There are some challenges to implementing newer technologies, however. For example, there’s not much competition among manufacturers of battery electric trucks, keeping equipment costs high. And railroads foot the electrical infrastructure bill. Class Is also must navigate an evolving regulatory landscape. BNSF needed to get regulatory clearance to test liquefied natural gas locomotives, for instance. 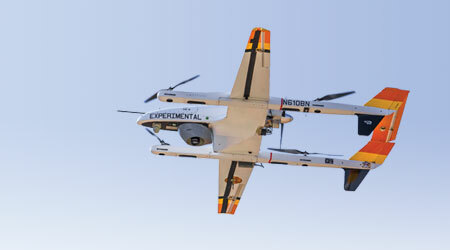 “You have to keep in mind the financial, regulatory and operational components for any of these technologies,” Lovenburg says. NS’ technological pursuits include GE Transportation’s Trip Optimizer system, which is aimed at improving the rate of fuel consumption based on a train’s makeup. The railroad also deploys New York Air Brake’s Locomotive Engineer Assist/Display and Event Recorder (LEADER), a train control and energy management system designed to reduce fuel usage. Aside from new and emerging technologies, railroads are exploring other ways to raise the bar on sustainability. For instance, BNSF often conducts restoration revegetation after construction projects. It’s one way the railroad “embeds green practices into our normal rhythm of business,” Lovenburg says. It’s a similar story at NS, which has embarked on its “Trees and Trains” carbon-mitigation strategy. 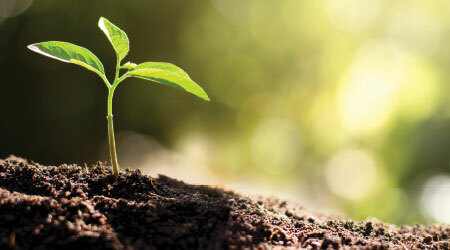 The railroad has spent $5.6 million to reforest 10,000 acres in the Mississippi Delta area — a venture expected to generate 1.12 million “carbon credits” for NS, according to the Class I’s sustainability report. These credits can be used to offset carbon emissions or sell to others wishing to do the same, NS officials said in the report. Emission reductions are a focus at CSX, too. Since 2011, the railroad has cut greenhouse gas emission intensity by about 5 percent, according to CSX’s 2017 corporate sustainability report. The Class I also focuses on reducing emissions of other “ozone-depleting substances,” including nitrogen oxides and sulfur oxides. In 2017, CSX emitted 56,505 metric tons of nitrogen oxides, marking a decline from 71,967 metric tons in the prior year. “With a constant eye on controlling costs and utilizing our assets more effectively, we have been reducing our carbon footprint, minimizing impacts on the environment and helping customers create a greener, more efficient supply chain,” CSX President and CEO James Foote wrote in the report. CSX may get an added sustainability boost by implementing precision scheduled railroading (PSR). For Canadian Pacific, implementing the efficiency- focused operational strategy has been “the most significant sustainability work undertaken,” said spokesman Andy Cummings in an email. Championed by the late E. Hunter Harrison, PSR shifts operational focus from moving trains to moving rail cars, and minimizing car dwell. The practice has improved fuel economy and reduced greenhouse gas emissions, Cummings said. Likewise, at CN, “the single best way” to improve the environment is by improving locomotive operating efficiency, officials noted in the railroad’s 2016 sustainability report. “In many cases, business objectives dovetail seamlessly with sustainability,” CP’s Cummings said. For instance, the largest source of greenhouse gas emissions at CP is locomotive fuel consumption, which also is one of its most substantial operating costs. As a result, reducing fuel consumption can impact both profitability and the environment. Last year, CP kicked off a multiyear locomotive fleet modernization program in partnership with GE Transportation. The project includes installation of advanced diesel engines, efficient cooling systems, improved traction and technological enhancements. What’s more, each unit will be equipped with GE’s Trip Optimizer software, as well as its distributed power features — both of which are certified by the U.S. Environmental Protection Agency (EPA) as fuel and emissions reduction technologies. CP expects the upgrades to improve each locomotive’s fuel efficiency by nearly 3 percent, Cummings said. In 2017, the Class I modernized 30 locomotives. This year, CP anticipates upgrading 80. To hammer home the sustainability message among employees, CP shares information though its magazine and company intranet. Information also is available to workers through the railroad’s corporate sustainability report and investor factbook. In addition, CP last year formed a sustainability steering committee with staff from various departments and levels of management. Committee members meet regularly to discuss sustainability planning, establish monitoring and reporting practices, evaluate performance and work toward building a sustainability strategy, Cummings said. Employee engagement is a crucial to CN’s sustainability practices, too. The railroad continuously trains crews and rail traffic controllers on best practices for fuel conservation, including locomotive shutdowns in yards, according to the railroad’s 2016 sustainability report. To maximize environmental sustainability efforts, Kansas City Southern maintains compliance with Global Reporting Initiative standards in its sustainability reports. To be sure, accountability is a key part of any road’s sustainability initiatives. To maximize their environmental sustainability efforts, Kansas City Southern officials maintain compliance with Global Reporting Initiative (GRI) standards, spokeswoman Doniele Carlson noted in an email. 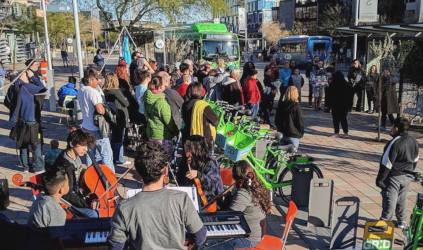 “KCS is implementing processes and procedures to track progress on many sustainability initiatives, which can be challenging given the complexity of a network spanning over 6,700 route miles across the U.S. and Mexico with varying levels of sustainability engagement and multiple methods of data measurement and reporting,” she said. To address that challenge, KCS is using internal data to monitor energy use and evaluating various certifications and reporting methodologies to align with its own sustainability practices, Carlson added. On the employee side, KCS highlights workers’ personal efforts to lead sustainable lives. The railroad also has installed electric car-charging stations at its corporate headquarters in Kansas City, Missouri. What’s more, KCS worked with more than 125 employees to compile its most recent sustainability report, Carlson said. “KCS is fully engaged, committed and taking action toward greater sustainability for people and the planet,” she added. Meanwhile, Union Pacific Railroad has been keeping a careful eye on greenhouse gas emissions and environmental accountability, as well. Although the railroad’s 2017 locomotive fossil fuel emissions actually grew to 10,216,978 metric tons from 9,913,870 metric tons in 2016, UP last year logged its best-ever fuel consumption rate. BNSF’s sustainability initiatives range from LED light retrofits in rail yards to battery electric equipment to restorative revegetation after construction projects. To that end, the railroad has acquired 28 new locomotives that meet the EPA’s Tier 4-emissions standards. The new units are estimated to reduce particulate emissions from diesel locomotives by as much as 90 percent, and nitrogen oxide emissions by as much as 80 percent, according to the report. The railroad — which in September announced plans to implement PSR principles — plans to purchase even more Tier 4 locomotives. 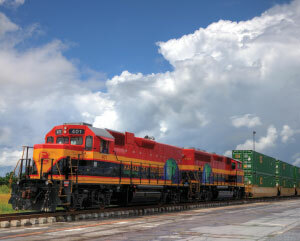 Like UP, CN is working to improve efficiency by purchasing new locomotives. In 2016, the Canadian Class I acquired 90 new high-horsepower locomotives. The railroad has also installed locomotive telemetry systems and Trip Optimizer to help further cut down on emissions, CN officials said. In addition, nearly 300 of BNSF’s 8,000 locomotives are Tier 4 units. But to chip away at greenhouse gas emissions and improve overall environmental sustainability, rail execs acknowledge there’s much more to do than roll out new equipment and technology. Email questions or comments to daniel.niepow@tradepress.com.